The ancient Hippodrome of Constantinople was built between 200 and 300 as a stadium for horse racing, chariot racing, and other amusements. Seating up to 100,000 people, there isn't much remaining of the structure today. Now the site of the Hippodrome in Istanbul is a beautiful public park with a few remaining columns hinting at its grand past. 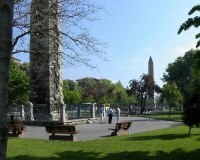 The Obelisk of Tutmosis III, the Basilica Cistern, the Fountain of Wilhelm II, and the Serpentine and Constantine Columns are popular landmarks within the park, which also offers free wireless internet. Address: Binbirdirek Mh., Sultan Ahmet ParkÄ± No:2, Fatih/Ä°stanbul, Turkey. Opening times: Open 24 hours a day, seven days a week.